If I knew where to find music that sounded like the opening of the heavens with glory and happiness shining down you would be hearing it right now. If you know of this music, turn it on. Right now. Because this is the day I the world has been waiting for. And this day deserves music. Glorious music. I'm playing music in celebration as I write this post. It would still be better if glorious sounds came out when the post opens, but I don't know how to do it they say that readers hate having music burst forth when they open a blog. Remember this? Remember the agony??? 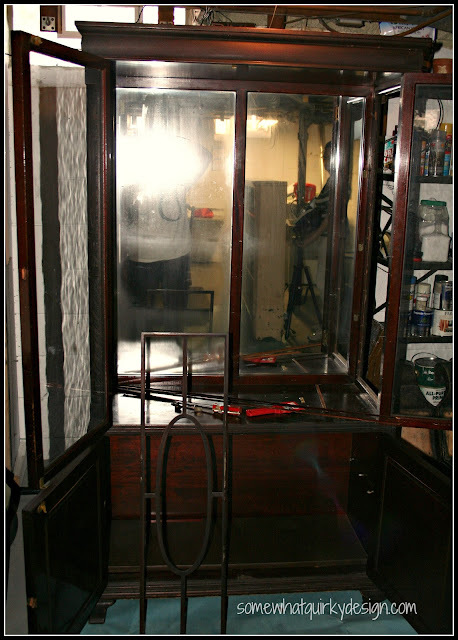 Of taking it apart and stripping off 247 layers of lacquer? Of deciding AFTER it was already a sticky gooey mess that I was going to paint it??? I'm not showing the really gross pictures because I don't want anyone to vomit to ruin the occasion. Was it worth it? You can stay awhile and stare if you like. 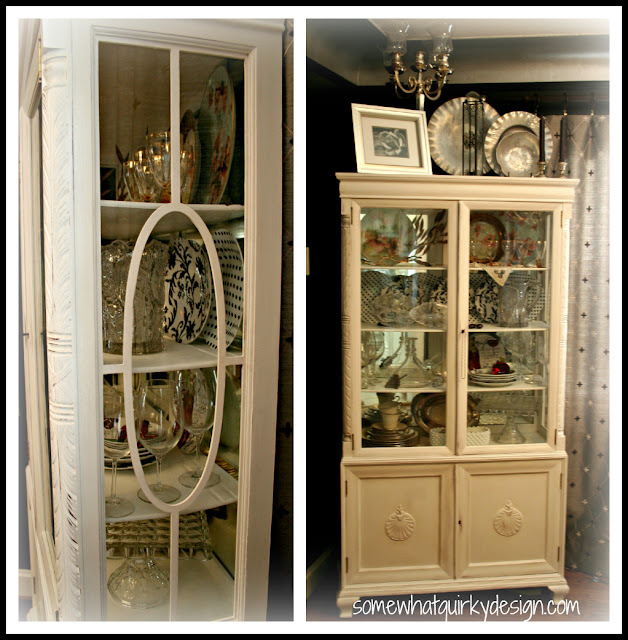 PS - So you will know - the china cabinet is now covered with 2 coats of Annie Sloan Pure White Chalk Paint. This is over 2 coats of primer. I initially primed inside the bottom cabinet with Zinsser 1-2-3 water based primer because I was using oil based paint for the turquoise. The wood leeched into the primer and turned everything pink. I went ahead and primed everything with this primer. 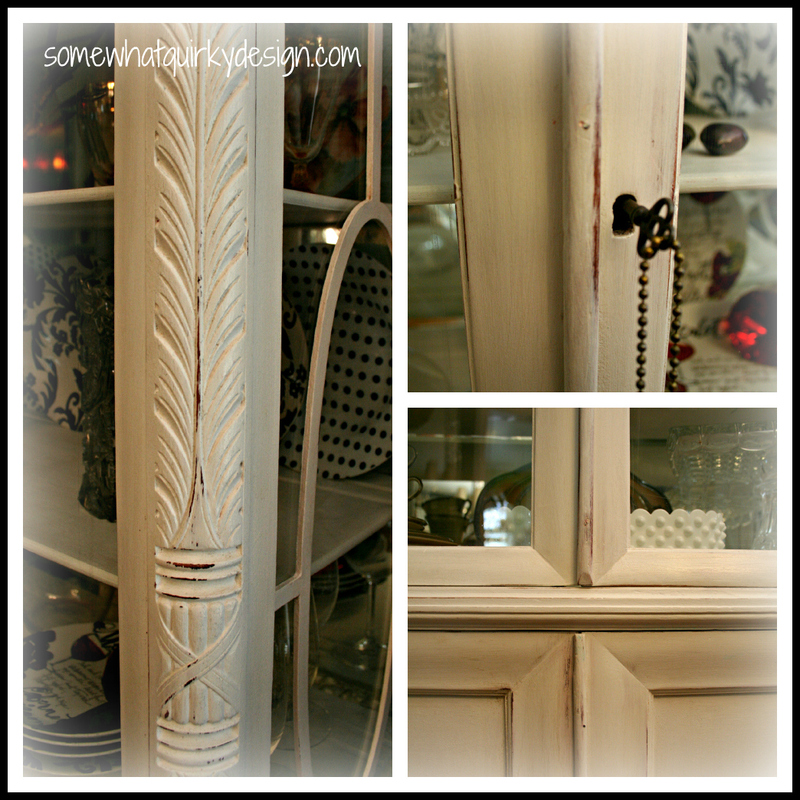 Then I used a coat of Benjamin Moore oil based primer to stop the pink from leeching through. Some places I had to prime again before I had a white base to work off of. I was glad that I didn't waste my chalk paint painting over the raw wood. 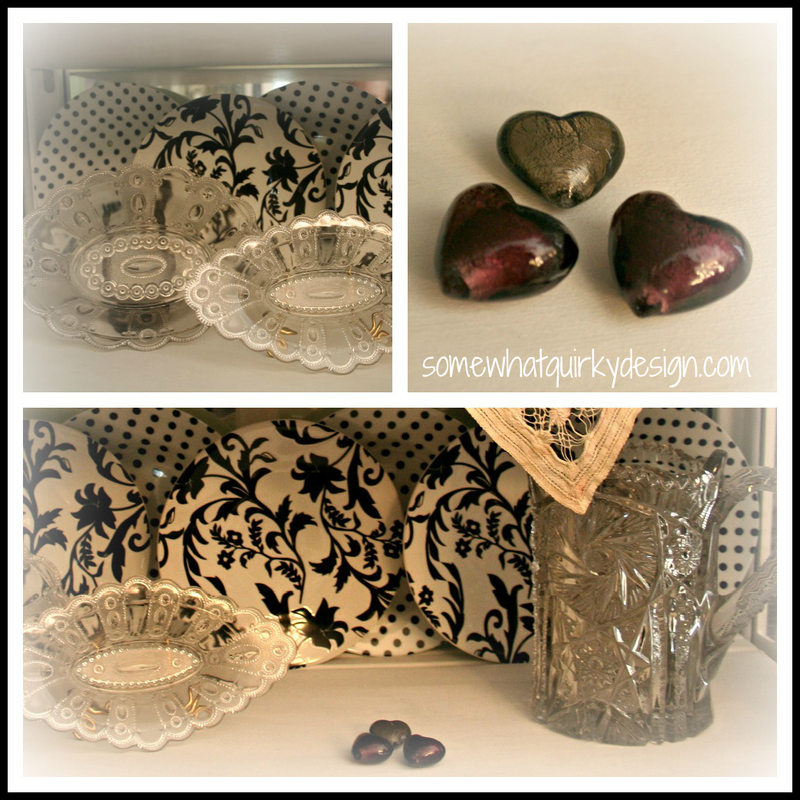 I used Annie Sloan's clear wax and dark wax. Update: a before after combo was requested - here it is. Holy China Cabinet!!! Does that look some kind of GOOD!! The turquoise inside is da bomb girl!!! Love, Love, Love! I actually did hear angels singing when I saw the final reveal... nice job! You are my hero! I would NEVER have had the fortitude to actually get this home. It looks so lovely. I'm so happy for you! Yeah. 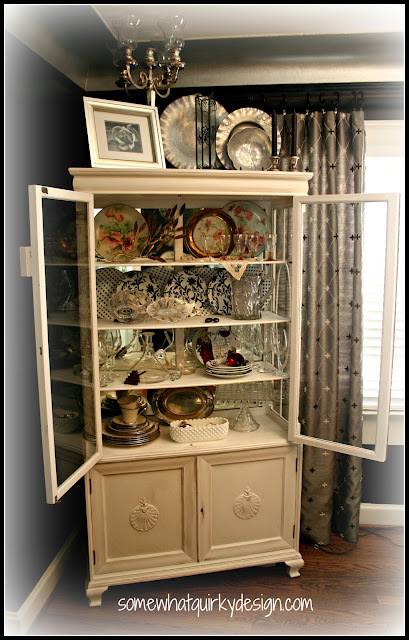 That china cabinet is pretty darn awesome. And sort of, kind of, exactly what I need for my dining room makeover. Love it! 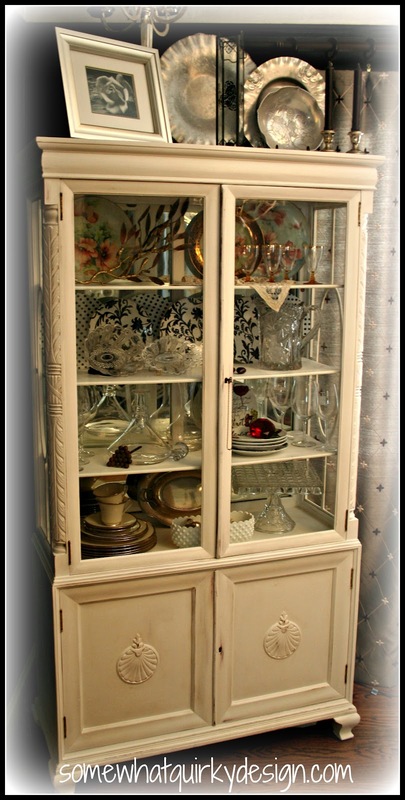 Karen, you did a fabulous job on the cabinet. Truth be told, I like it painted because it brings out the details. All that work. Wow, I am impressed with your determination. I heard the music! It's still ringing in my ears. Holy moly did you ever do just the right number on this beauty! The turquoise was a fun surprise. I would have never thought to do that. I love it. Now, how do we pull you away from gazing at this work of art in order to go and sit in your new front porch chair so you can greet the mailman when he brings you your publisher's clearinghouse prize? Do they still even do that? Well, either way, you deserve a prize for your vision and tenacity and style. Can't wait to see the other side of the porch. I can hear the music too - it's absolutely gorgeous Karen, what an amazing job. Definitely worth it. 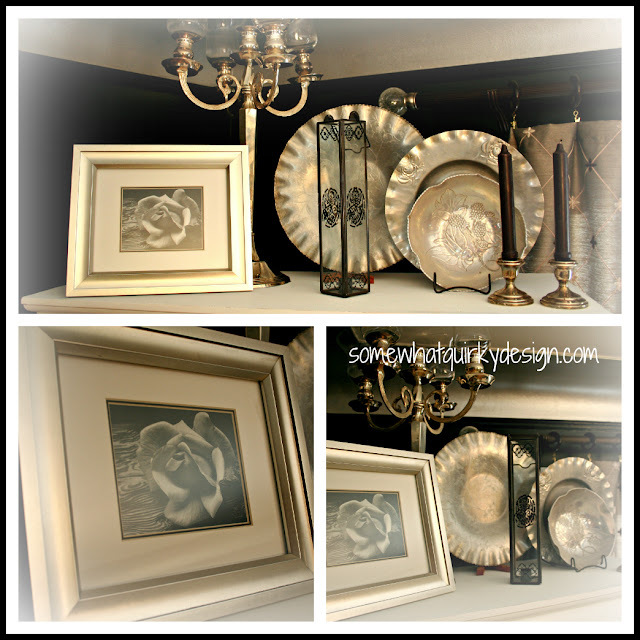 Love all your displays too. You deserve a round of applause, and three rounds of 'hip hip hooray'! Doesn't that feel good, when a project turns out so spectacular?!! All I can say is, WOW!!!! Love the blue inside also!! Thanks for the inspiration! It's really pretty. Love the color! Your hutch is wonderful! 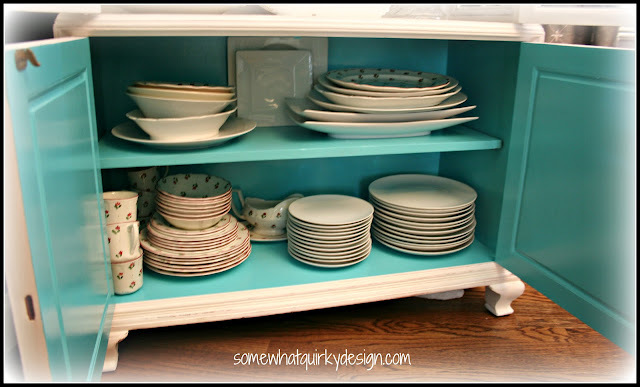 I love the surprise turquoise inside the bottom of the hutch. That is one hot mama! Love the blue surprise inside! Roll me over!!!!!!!! What a fabulous transformation! You really did such a good job, Karen!!! This is spectacular - absolutely beautiful job ( love the turquoise surprise )!!! 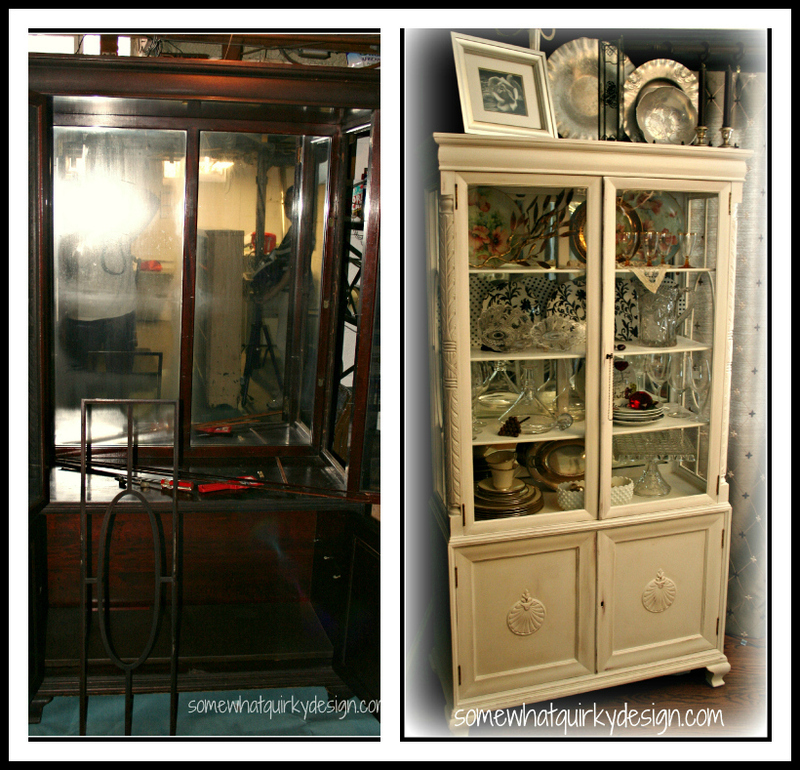 Absolutely gorgeous redo! Stunning, stunning, stunning. I hate stripping. I stripped my daughter's civil war era dresser which also had tons of laquer. It was gross! You really cleaned her up nice and I adore the secret pop of aqua underneath...genius! 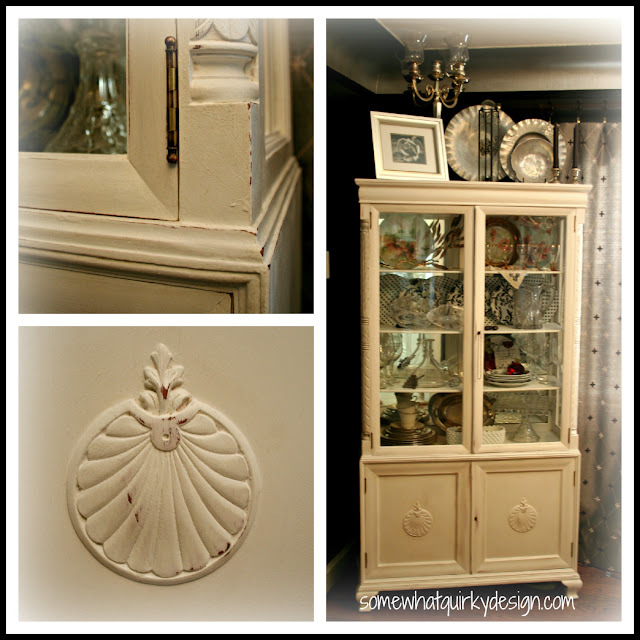 The cabinet was a perfect candidate for chalk paint, great detail! Hi Karen! Our entries over at "Between Naps on the Porch" could be cousins (your project would be the prettier cousin though). 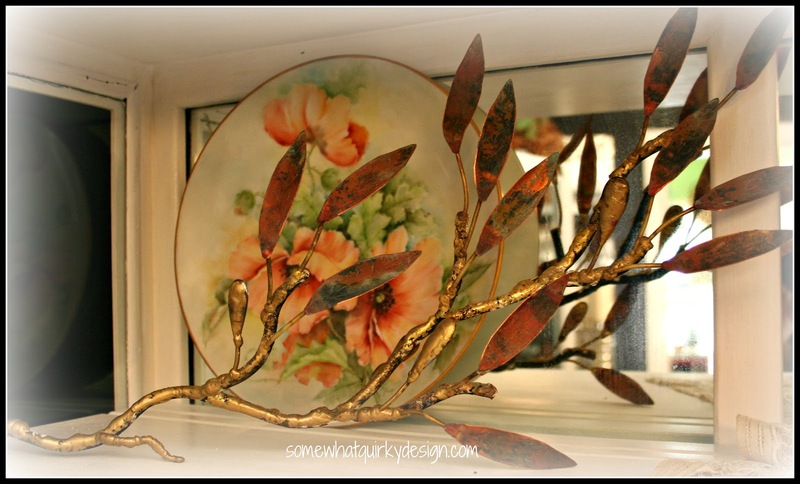 I painted an old piece with "Old Ochre" chalk paint this week. 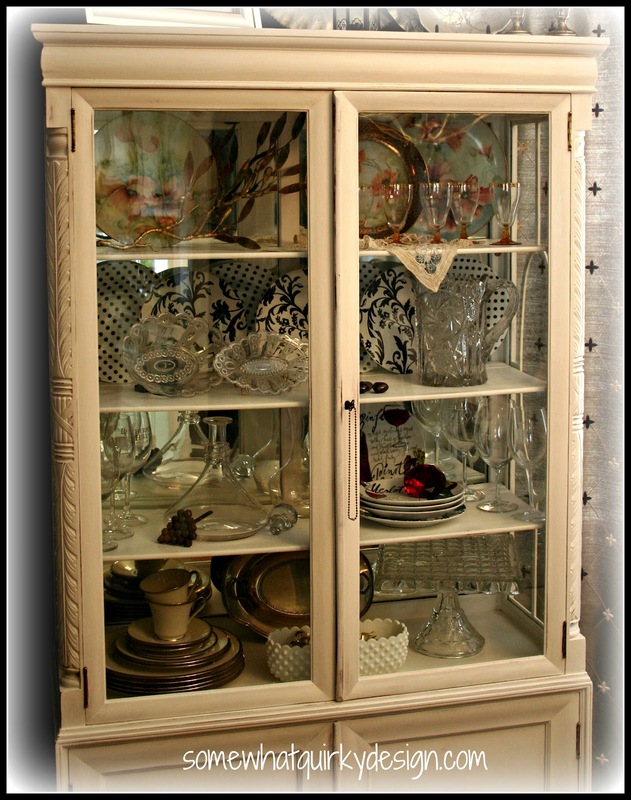 Your china cabinet looks just GREAT! I am following you now. The makeover looks outstanding...love the colors that you went with. Thanks for sharing it with us at NTT. I am hearing the music as I type, this is an incredible makeover. It is so darn beautiful now. Keep it, I could never give it away! I let the hubs do the stripping - aren't I nice. So pretty! Thanks for sharing your creative inspiration with Sunday's Best. Wow! What a lot of work you put into this lovely cabinet! It turned out beautifully! Well done! I bet half way through you wished you hadn't started...or is that just me! You've done a beautiful job I love it. WOW!! What an impressive piece!! Love all the treasures inside!